One of the pictures clicked from Sunny Leone’s visit to Kochi. 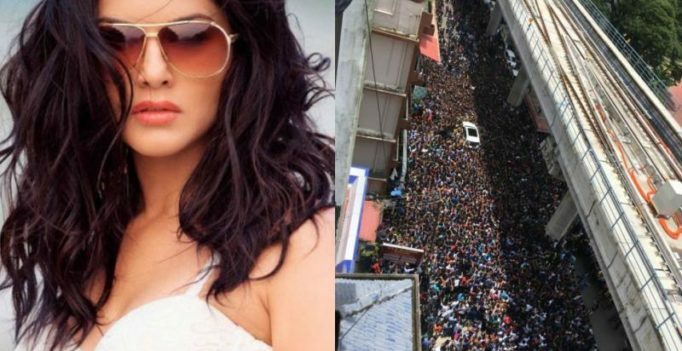 New Delhi: Sunny Leone is surely not going to forget the people of Kochi, for a very long time. The actress was in the city for the launch of ‘Phone 4 Digital Hub’ showroom at MG Road. As the ‘Baadshaho’ actor reached the venue, she was flooded with thousands of fans. Even Twitteratti took the opportunity to come with interesting captions for the picture. Here’s some of the best ones. Sunny was sporting enough to choose her favourite one from the lot. The police also filed a compliant against the mobile store owner for the chaos that was created at the event.